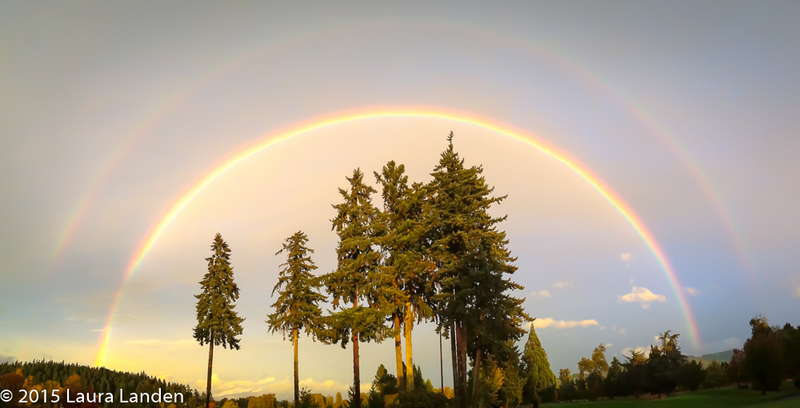 A photographer’s dream appeared–a double rainbow, perfectly framing a group of pines! How lucky can you get? Until, of course, you realize you do not have a camera, not even the camera on your smartphone. Not too smart, it turns out. However, luck does prevail when your sister-in-law has her (creaky, outdated) iPhone. Having borrowed it, I discovered that the iPhone camera would take panorama shots. The above image is the result. Enjoy! It is your on-the-ball sister-in-law who is creaky and outdated; her iPhone performed perfectly! So beautiful and yes lucky to capture it.